I've now entered the Blogosphere with two posts about the consciousness behind the music. The enhanced liner notes for A Higher Dimension and Light from Assisi give details about what each track offers in consciousness and more of the story of these seminal albums. There are also links where you can listen to the albums while reading. I'll be playing a Holiday Concert Sat. Dec. 5th in Doylestown, PA, followed by an Ascension workshop the next day with Elizabeth Joyce. Proceeds to benefit Abington Hospital Hospice. (See touring info below). Then on Monday Dec. 7th I'll be giving a private house concert in NYC at the home of Elizabeth Hepburn and Ben Bryant. There are a few seats still available for this concert so please RSVP by Dec. 2nd by calling 828-658-9604 or replying to this newsletter, and I'll send the address and reserve your space. I had a delightful and intense time in NYC, filled with both opportunities for mastery and synchronicities. Imagine my surprise when the check at the Stargate Cafe was for $11.11! My friend Kate traveled with me and helped out at the New Life Expo and all my concerts. Here's a video of a Musical Soul Portrait I did for Divine Inspirations Bookstore in Nutley NJ. Holiday Concert "Music for Healing and World Peace." Proceeds to benefit Abington Hospital Hospice. For information and reservations see www.thebcma.net email info@thebcma.net or call Elizabeth at 215-996-0646 Tickets: Members - $25, non-members $30 (Membership and discount available at the door). Light refreshments will be served. 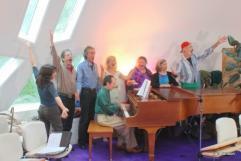 ASCENSION HEALING WORKSHOP With Elizabeth Joyce & Dr. Bonnie McDade with music by Richard Shulman. Location in the Doylestown area. Workshop Fee: $100, Discount price $75.00 for concert attendees, Additional Family Member or Buddy receive a $25 discount. The Charity is Abington Hospital Hospice. To Sign Up call Elizabeth at 215-996-0646 This workshop has limited seating. Mon., Dec. 7th New York, NY 7:00 pm Meditation Concert at the home of Elizabeth Hepburn and Ben Bryant, Upper West Side, Manhatten. Limited seating, so please RSVP by email or phone 828-658-9604 and we will send you the address and reserve your seat. "Healing Vibrations through Music" ... COVR award winning (2009 Meditational/Healing Music) keyboardist / composer, Richard Shulman presents a concert to touch the center of the sacred within. Tune in to your own I AM Presence by resonating with uplifting and meditative music from his CD's and a piece composed spontaneously for the audience. Music from Camelot Reawakened, 11:11 Piano Meditations for Awakening, and Ascension Harmonics all available at the Bookstore. MUSICAL SOUL PORTRAIT PRIVATE SESSIONS: A Musical Soul Portrait session will give you music which follows the path of your own Divine connection. Each one hour session includes your own recorded musical journey on CD which can awaken memories and visions, activate your own soul mission and give you the feeling and recognition of "Coming Home." 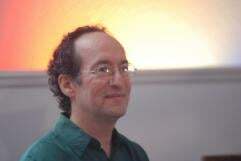 Concert, Celestial Vibrations through Music... COVR award winning (2009 Meditational/Healing Music) keyboardist / composer, Richard Shulman presents a concert to touch the center of the sacred within. Tune in to your own I AM Presence by resonating with uplifting and meditative music from his CD's and a piece composed spontaneously for the audience. Music from Camelot Reawakened, 11:11 Piano Meditations for Awakening, and Ascension Harmonics all available at the Bookstore. 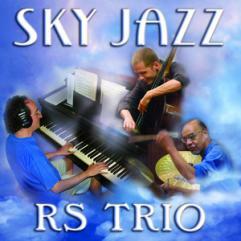 Pianist Richard Shulman is best known for his New Age and classical-influenced piano works, so I was as surprised as anyone when his new jazz trio project release, Sky Jazz, landed in my hands. Unlike some others from the New Age music genre who have tried their hands at jazz, it’s obvious that Shulman has the chops to back up his aspirations—with room to spare. Working with bassist Mike Holstein and drummer Sonny Thornton, Shulman offers no allusion to fusion or pop leanings, instead making it perfectly clear from the opening “Pictures in the Clouds” that this is a jazz recording in the classic sense. Standouts include the bluesy “Getting Over Lost Love,” the gently swaying “Goodbye to Fantasy,” and the nearly 10-minute tour de force “Still Young at 95.” These cats can play, no doubt about it! I've started doing interviews with various composers, performers and recording artists in a fabulous new magazine called New Awareness Magazine. The first interview is in the Dec.- Jan.issue with one of the major pioneers of meditative and healing music, Stephen Halpern. May the inner Light shining so bright in you during this Christmas Hanukkah Solstice season radiate, blessing all.